This speaker has strong BT 4.2+EDR technology which makes data transfer and connection much quicker. It also has a 12W strong power horn, which includes four 3W horns, they will provide you with double-channel layered sound. It supports TF card and AUX in play mode. Also has FM function, you can switch mode simply by pressing a button. It is perfectly suitable for your home, bringing you warm and sweet feeling. With the range about 33ft, it is compatible with smart phones, tablet PC and laptop, easily connected to almost all BT-enabled devices. Plus, the high-end wood material is delicate and exquisite. With simple and elegant minimalist style design, brings you natural and comfortable feel. 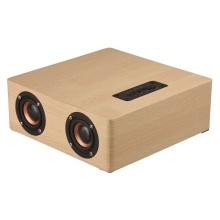 Believe this wooden speaker will bring you much enjoyment! [Advanced BT Technology]: Built with BT 4.2 version, the data transfer and connection speed are much quicker. Range about 33ft, you can easily connect with BT-enabled devices and enjoy music. [High-fidelity Sound]: Equipped with 4*3W high-powered horn and bass diaphragm, provides you with bright and undistorted sound. The 12W strong power brings you double-channel layered sound. [Multiple Functions]: Support TF card and AUX in play mode. Also has FM function, switch mode simply by a button. It is perfectly suitable for your home, bringing you warm and sweet feeling. [Wide Compatibility]: Compatible with smart phones, tablet PC and laptop, wide-compatibility makes the speaker easily connect to almost all BT-enabled devices. [Practical Design]: High-end wood material is delicate and exquisite. Minimalist style design is simple and elegant. Bring you natural and comfortable feel. Note: It supports TF card and U-disk reading up to 32GB.